Coriander infused beef served with roast aubergine wedges & fresh coriander. Roast aubergine: Place on a tin foil lined baking tray with a good glug of olive oil. Season with salt and pepper and mix. Arrange in a single layer, skin side down, and roast for 30 minutes, until soft and golden. Coriander mince: Place a pan on medium-high heat with a drizzle of olive oil. Add the onion with a pinch of salt and cook for 5 minutes. Then add garlic and mince, season generously with salt and pepper and brown for 3 minutes. Add the coriander seeds, grated tomatoes and water (4 tbsp for 1) and cook for 10 minutes until the sauce thickens. In the last minute, stir in the harissa paste (quite spicy, so use as much or as little as you like). 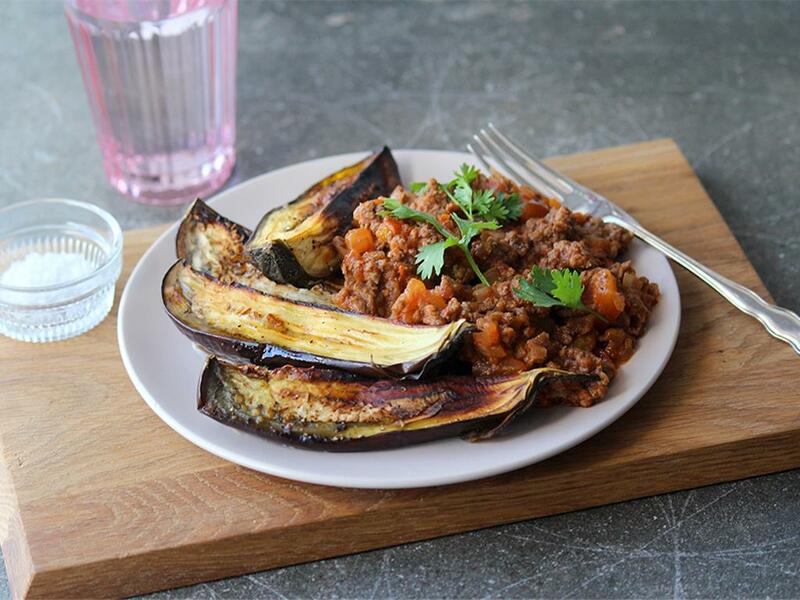 Serve the roast aubergine topped with the mince and fresh coriander leaves.